I saw a commercial that tried to invoke our nostalgia by showing clips of super-8 films. Well, I wasn’t impressed! I recognized instantly that it was phony– just video manipulated to look like old film footage. I saw through the unconvincing scratch marks and the flares of golden light. I know their tricks and their manners, as Jenny Wren would say. How do I know their tricks? Because I recently downloaded an app for my phone called Super 8, and I’ve spent the last couple of days making a movie with it. I know it’s silly as hell, but I kind of love it. It’s just one more in a long line of oddly compelling visual nostalgia devices available at the touch of a screen, with their washed out seventies colors and their old polaroid shaped shots. It’s funny how super-8 film always feels like a memory, how it can make you nostalgic for a time you might not have lived yourself. We didn’t have a super-8 camera when I was growing up, but I can almost imagine scenes from my childhood as though I’d seen them projected on a screen, silent and dreamy, with the tick tick tick of the equipment marking the passing of time. In super-8-fueled nostalgia, everything seems bright and golden and glowing. It’s always late evening on a perfect summer day, just as the sun slips away and you think about seasons changing and years flying by and children growing, and everything seems unspeakably precious. And now it’s been cheapened as a marketing tool. According to my beloved OED, the term “nostalgia,” was originally used to describe an illness or malady, and I must say it seems very wrong of the people who are selling whatever they’re selling to take advantage of the condition. Of course the beautiful thing about super-8 film, which no phone app can capture, is that it’s limited. Each little reel is three minutes long. You have to think carefully about what you want to capture, about which moments are the important ones. You can’t randomly film until you run out of batteries. And the little reels of film were not cheap or easy to develop, which added even more weight to the decision about what to film, but added immeasurably to the delight in seeing how everything came out. And those golden flares of light, so cynically copied by my phone app and the stupid commercial–those flickering pools of sunshine came at the end of a reel, as it wound itself out…they signalled the limit of your filming…the moment when the film ended and the people in the shot danced off into bright spots of light. The moment you had to put the camera down, and live the hour as it happened, before it got away from you. It’s beetaroni pizza, man! I roasted thinly sliced beets with tamari, smoked paprika, balsamic and a little bit of smoked sea salt. I’m not sure I remember exactly how pepperoni tasted, but these little roasted beets were very good! Salty, sweet, smoky, chewy. Of course I used them to top a pizza!! This recipe makes two big cookie-sheet sized pizzas. I used all the beetaroni on one pizza, and put olives on the other. Well, here it is, my pseudo-super-8 film. I took some footage of the boys walking down to the creek, because everything about going to the creek captures everything about the height of summer nostalgia, to me. The song is Tezeta, by Mulatu Astatqé, I believe that “tezeta” means nostalgia. It certainly sounds as though it should! Spread the beets in a single layer in a roasting pan. Mix the marinade ingredients, and pour over the beets. Adjust amounts to ensure that the beets are all covered with a thin layer of marinade. Let sit for 20 – 30 minutes. Roast the beets in the marinade until they’re soft inside and crispy outside, about 20 – 25 minutes. Turn them from time to time to ensure even browning. Keep an eye on them, because they burn easily. Remove them to a plate and sprinkle with smoked sea salt, if you have it. In a large bowl combine the flour, herbs, and salt. Make a well in the center and add the yeast mixture and the olive oil. Stir well, and add enough warm water to form a soft dough. You want it to be as wet as it can that you can still comfortably knead it. Knead for about 5 minutes until soft and elastic. Put about 1 tablespoon of olive oil in a large bowl. Roll the dough in this so that it’s evenly coated. Cover the bowl with a damp cloth and set aside for two to five hours, till it’s doubled in size. Lightly oil to pizza pans or cookie sheets. Divide the crust into two, and roll or stretch each to fit the pans…I tend to press down with my palms to flatten out the dough, rather than roll it out, for pizza. Let the dough rest while you preheat the oven to 450. Place the pans in the oven and cook for five or ten minutes till they’re still pale but they’re firm to the touch and they lose their shine. Cook until the crust is golden and the cheese is starting to bubble and turn brown–about fifteen minutes. 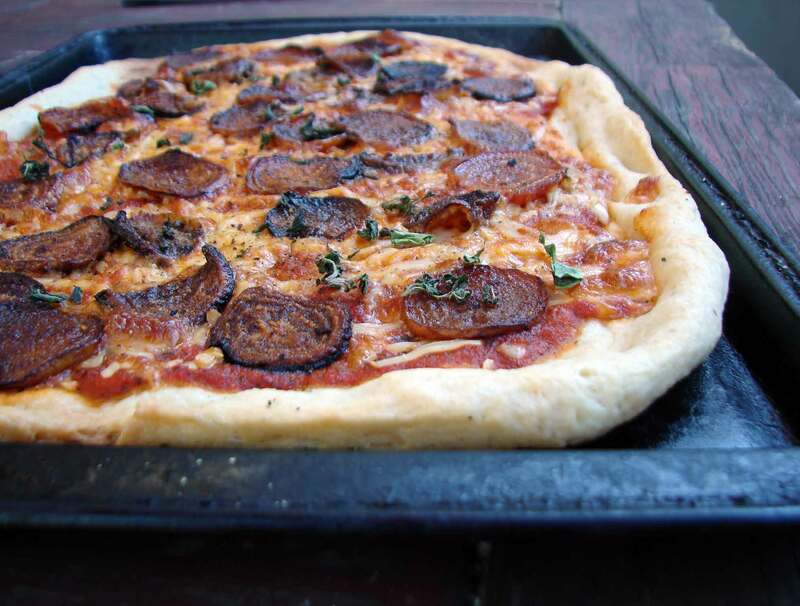 This entry was posted in bread, crust, recipe and tagged beet pepperoni, beet pizza, homemade pizza, roasted beets, vegetarian pepperoni by Claire. Bookmark the permalink. THanks for watching, TFD. I’ve only belated realized that it’s a rather dull film!! I don’t know if I could keep away from carbs…bread and potatoes are my favorites. (Well, after vegetables, of course!!) I was going to say you could make the pizza with a potato crust, but that’s carbs too. Damn. It’s not in the least dull – it’s funny and sweet. Love this post, Claire. The film made me smile, cry, and feel nostalgic for my family’s home movie days. You come up with witty names for your dishes. I love pepperoni, but feel creepy about it, too. 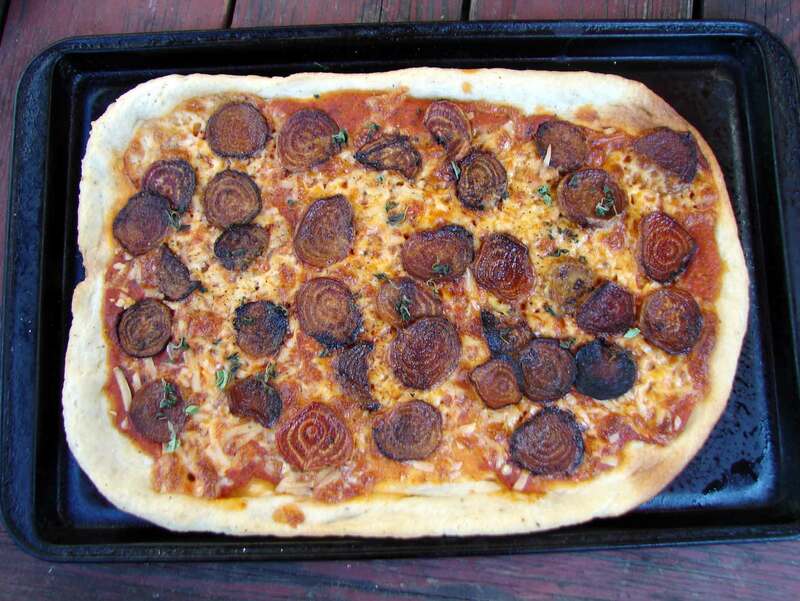 I’m gonna try your Beetaroni Pizza. Fascinating article, Diane! Thank you so much. A lot to think about there.